The line-ups were back outside Maple Leaf Gardens yesterday. 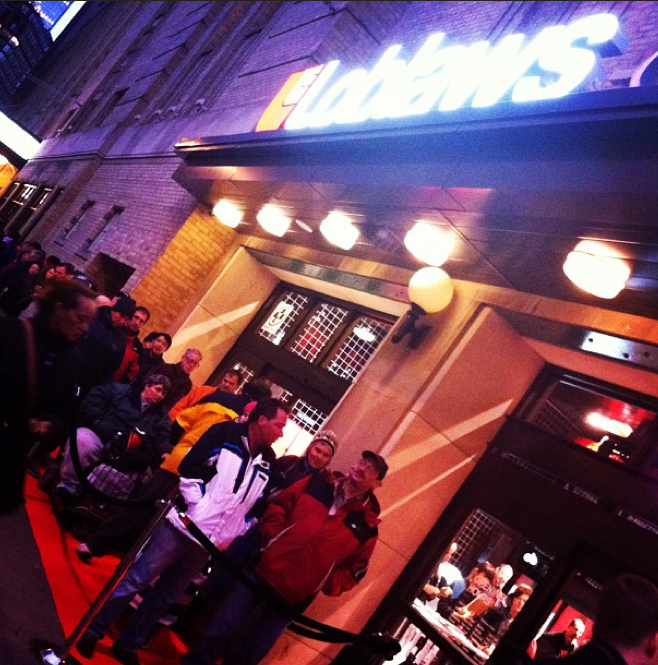 I arrived at 7:15am for the Loblaws grand opening, shocked to be greeted by a cue of people winding from Church Street back towards Yonge. Loblaws employees were handing out muffins and tea and media were huddled outside the entrance waiting to witness the reveal of what one photographer referred to as an “airport-size” grocery store. 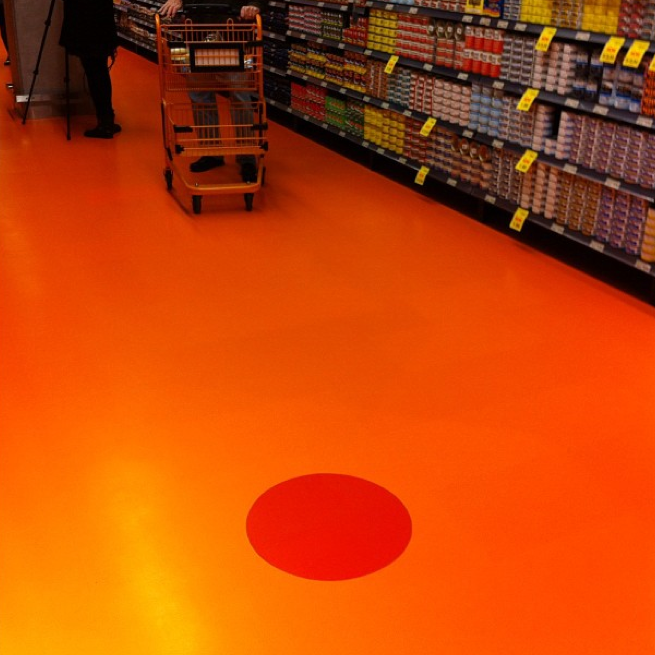 For nostalgia’s sake, here is centre ice (check out the funky orange grocery carts, might help the sadness melt away). At least canned tuna is puck sized. I don’t know if it’s cool or uncool to like this store. But, I liked it. 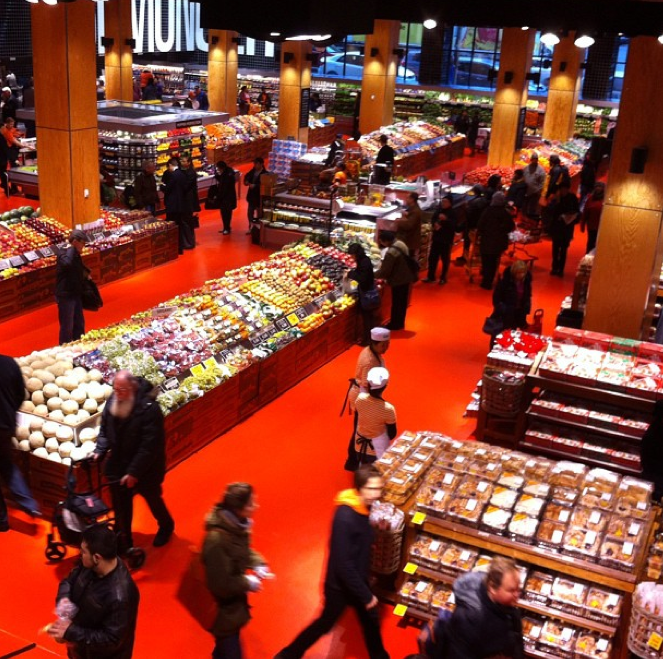 I would like shopping here–it’s a grocery store, has all the same products you expect (from detergent to Cambpell’s soup) but caters to foodies without the price tag of Whole Foods. 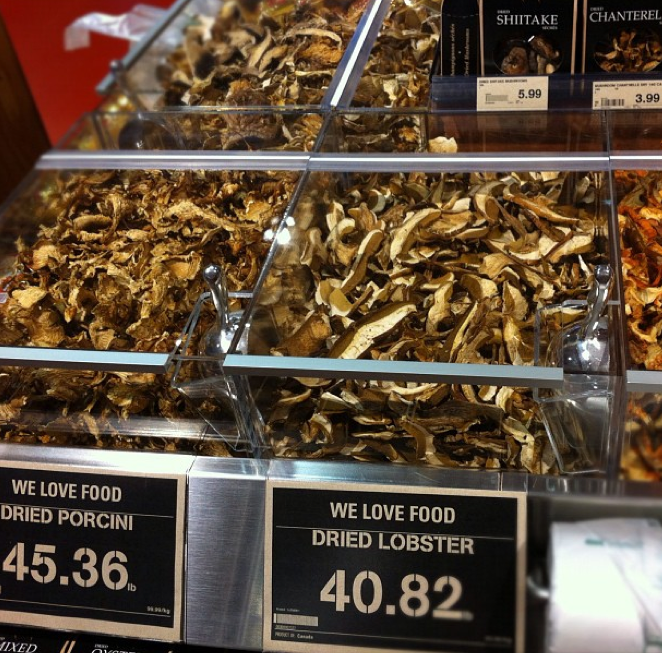 So, certain products are more luxurious…..look at the dried mushrooms on offer (the fresh mushrooms were also amazing). Realistically many of the shoppers here will be Ryerson students who can still find KD, diet coke and Mr. Noodle. And maybe pick up a caramel cupcake at the cupcake wall (they’re big on the food walls here). I should mention they make their own donuts in the bakery. Apparently the recipe began at Zehrs and word is they are pretty good for dunkin’. Another nice touch is the ability to pay for items in each section of the store. 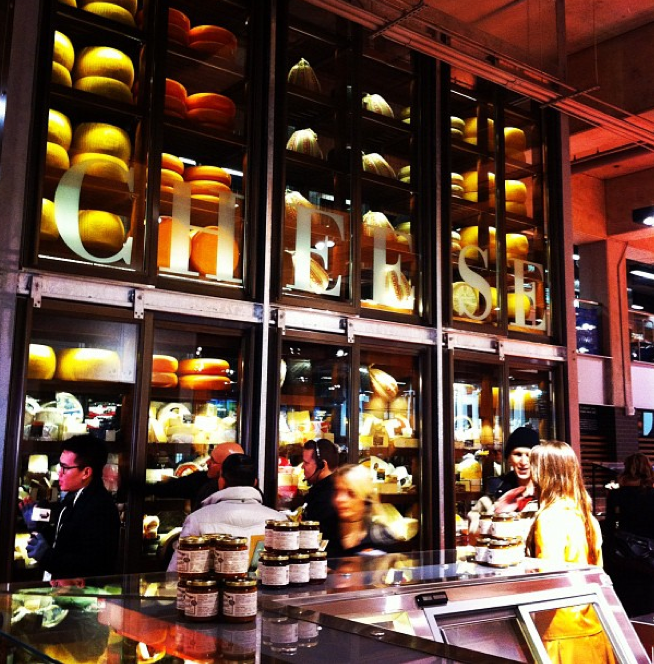 You can buy a juice at the juice bar, pay for your cheese at the cheese counter. Makes shopping more efficient and if you forget an item (and I always forget an item) you don’t have to go back through checkout at the front of the store. The aisles are wide–here’s a shot of the produce department from the upstairs kitchen (where all the “to go” food is prepared daily. The chef told us that their goal -though they do work with Second Harvest–is to only make as much food as they will sell in a day.) There is a butcher and fishmonger off to the left. In a first impression I tweeted that the space was like a loft– it’s open, industrial, when you walk in they’ve kept part of the original wall from the Gardens. There’s a sculpture made from the chairs in the original stadium in the shape of a Maple Leaf. But— let’s get to that cheese wall. Pretty impressive, right? I kind of imagined it more open–like maybe I could actually climb it, finding toeholds amongst wedges of Gruyere and Comte. But, this will do. What is actually most impressive (and I hope this is kept up) is the quality of the cheese. In the display case across from “the wall” were many soft and semi-soft cheese, all looking very ripe but the rinds still intact and in great shape. 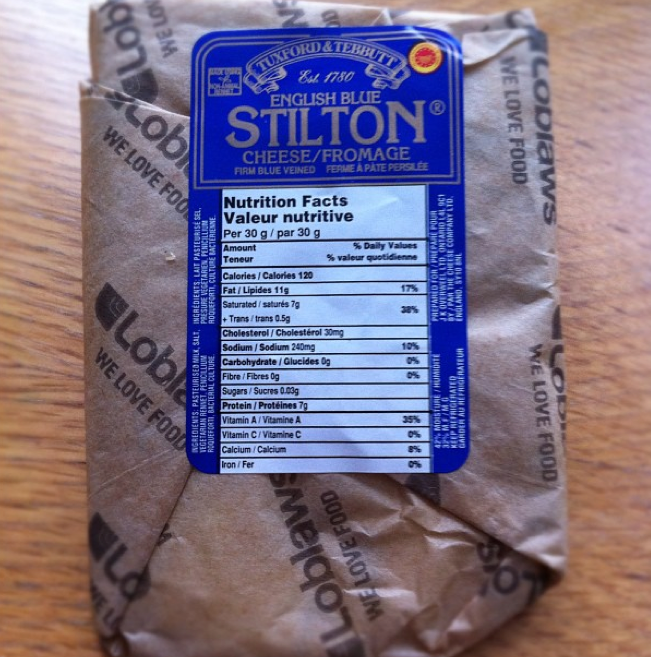 This is tricky at a large retailer when often you have to prepackage this type of cheese in unbreathable saran wrap. The cheese department here will cut cheese on demand. You can still reach into the fridges (those are sliding doors in the picture) and quickly grab a pre-cut piece of Mimolette (yes, they have Mimolette. SCORE!) or cheddar. But you can also turn around and have wedges cut smaller or request a taste. On opening day Gurth Purdy (the cheese buyer and passionate supporter of artisinal cheese) and his team were cracking full parmesan wheels in the traditional way. Check out this short demo from Whole Foods. Quite an art. 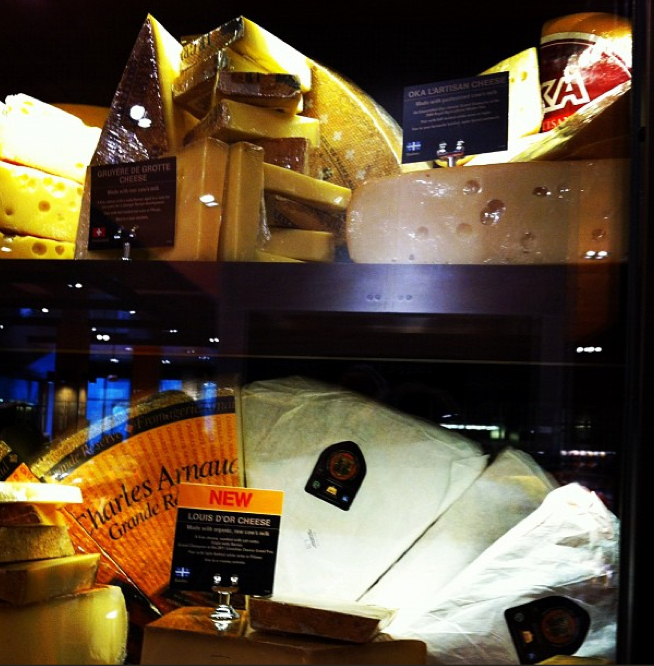 They also are the exclusive Ontario carrier of a soft washed-rind, raw milk, Quebec cheese called Pied-de-Vent. it used to be snuck into the province years ago but was not federally licensed. It looked droolingly delicious. Living in the east end, I’ll probably be sticking to my hood for the groceries but with a large parking lot beneath the store I might just head over from time to time to stroll the aisles. 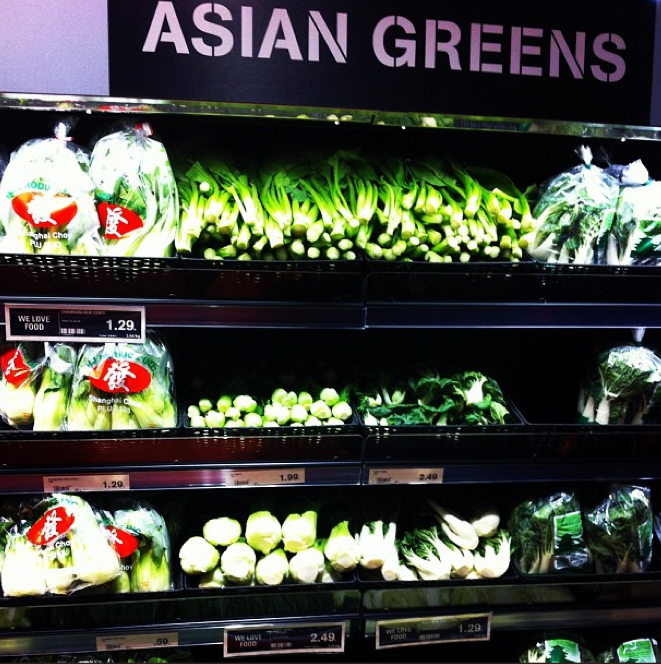 There’s a Joe Fresh and LCBO upstairs too. Eat, dress, drink. No word yet if you can bring in a hockey stick for a quick face-off with some canned salmon.